Intruders (Universal): Spanish-British horror film about an 11-year old girl forced to confront childhood demons. A Monster In Paris (Entertainment One): A French 3D-animated movie set in Paris during 1910, it centres on a monster who lives in a garden and his love for a beautiful, young singer. Directed by Bibo Bergeron. Although it was a year with a record number of sequels, there was much to feast on if you really looked for something different. The year will be remembered for momentous events which overshadowed anything Hollywood could come up with: the Arab Spring, the Japanese Earthquake, Hackgate, the death of Osama Bin Laden and the continuing meltdown of the global economy. But cinema itself underwent some seismic changes: in April the thorny issue of the theatrical window raised its head, whilst James Cameron suggested films should be projected at 48 frames per second instead of the usual 24. But by far the biggest story was the news that Panavision, Arri and Aaton were to stop making film cameras: although the celluloid projection will effectively be over by 2013, it seems the death of 35mm capture is only a few years away. So the medium of film, will soon no longer involve celluloid. That’s a pretty big deal. 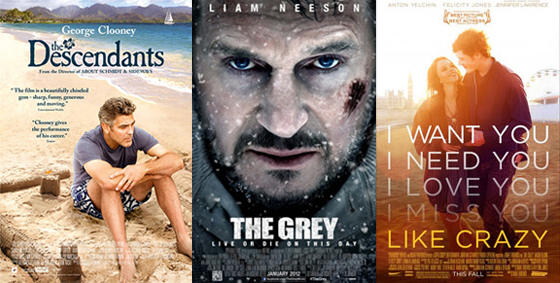 As for the releases this year, it seemed a lot worse than it actually was. Look beyond the unimaginative sequels and you might be surprised to find that there are interesting films across a variety of genres. Instead of artifically squeezing the standout films into a top ten, below are the films that really impressed me in alphabetical order, followed by honourable mentions that narrowly missed the cut but are worth seeking out. A Separation (Dir. Asghar Farhadi): This Iranian family drama explored emotional depths and layers that few Western films even began to reach this year. Drive (Dir. Nicolas Winding Refn): Nicolas Winding Refn brought a European eye to this ultra-stylish LA noir with a killer soundtrack and performances. George Harrison: Living in the Material World (Dir. Martin Scorsese): Scorsese’s in-depth examination of the late Beatle was a passionate and moving tribute to a kindred soul. Hugo (Dir. Martin Scorsese): The high-priest of celluloid channelled his inner child to create a stunning digital tribute to one of the early pioneers of cinema. Jane Eyre (Dir. Cary Fukunaga): An exquisite literary adaptation with genuine depth, feeling and two accomplished lead performers that fitted their roles like a glove. Margin Call (Dir. J.C. Chandor): The best drama yet to come out the financial crisis is this slow-burn acting masterclass which manages to clarify the empty heart of Wall Street. Melancholia (Dir. Lars von Trier): Despite the Cannes controversy, his stylish vision of an apocalyptic wedding was arguably his best film, filled with memorable images and music. Moneyball (Dir. Bennett Miller): The philosophy that changed a sport was rendered into an impeccably crafted human drama by director Bennett Miller with the help of Brad Pitt. Project Nim (Dir. James Marsh): A chimpanzee raised as a human was the extraordinary and haunting subject of this documentary from James Marsh. Rango (Dir. Gore Verbinski): The best animated film of 2011 came from ILMs first foray into the medium as they cleverly riffed on classic westerns and Hollywood movies. Senna (Dir. Asif Kapadia): A documentary about the F1 driver composed entirely from existing footage made for riveting viewing and a truly emotional ride. Shame (Dir. Steve McQueen): The follow up to Hunger was a powerful depiction of sexual compulsion in New York, featuring powerhouse acting and pin-sharp cinematography. Snowtown (Dir. Justin Kerzel): Gruelling but brilliant depiction of an Australian murder case, which exposed modern horror for the empty gorefest it has become. Take Shelter (Dir. Jeff Nichols): Wonderfully atmospheric blend of family drama and Noah’s Ark which brilliantly played on very modern anxieties of looming apocalypse. The Artist (Dir. Michel Hazanavicius): An ingenious love letter to the silent era of Hollywood is executed with an almost effortless brilliance. The Descendants (Dir. Alexander Payne): Pitch-perfect comedy-drama which saw Alexander Payne return to give George Clooney his best ever role. The Guard (Dir. John Michael McDonagh): Riotously funny Irish black comedy with Brendan Gleeson given the role of his career. The Interrupters (Dir. Steve James): The documentary of the year was this powerful depiction of urban violence and those on the frontline trying to prevent it. The Skin I Live In (Dir. Pedro Almodovar): The Spanish maestro returned with his best in years, as he skilfully channeled Hitchcock and Cronenberg. The Tree of Life (Dir. 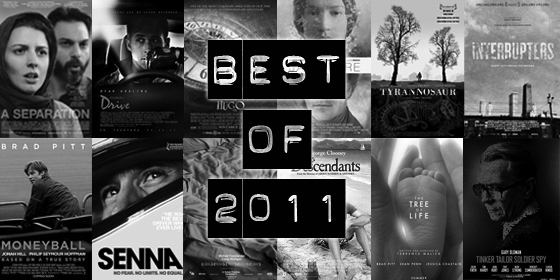 Terrence Malick): Moving and mindblowing examination of childhood, death and the beginnings of life on earth. Tinker Tailor Soldier Spy (Dir Tomas Alfredson): Wonderfully crafted John le Carre adaptation which resonates all too well in the current era of economic and social crisis. Tyrannosaur (Dir. Paddy Considine): Searingly emotional drama with two dynamite lead performances and an unexpected Spielberg reference. We Need To Talk About Kevin (Dir. Lynne Ramsey): Audio-visual masterclass from Ramsay with a now predictably great performance from Tilda Swinton. Win Win (Dir. Thomas McCarthy): Quietly brilliant comedy-drama with Paul Giamatti seemingly born to act in this material. A comedy-drama set in Hawaii marks a triumphant return for director Alexander Payne after a seven year absence and provides George Clooney with arguably his best ever role. Adapted from the novel by Kaui Hart Hemming, it explores the thorny emotional dilemmas facing landowner Matt King (George Clooney) after his wife is involved in a serious boating accident. He also has to deal with his two young daughters (Shailene Woodley and Amara Miller) and the lucrative sale of ancestral land but when secrets emerge about the recent past he is forced to reexamine his life. It seems odd that after all the critical and awards success of his last film, Alexander Payne should take seven years to make another, but the late 2000s indie collapse may have played a part. 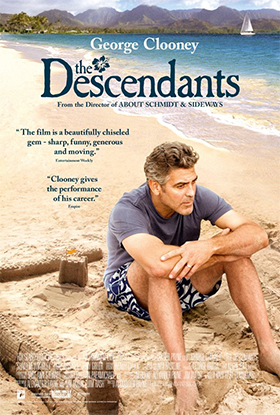 I’m happy to report that The Descendants maintains his remarkable run of films that begun with Citizen Ruth (1996) and continued with Election (1999), About Schmidt (2002) and Sideways (2004). Like those it masterfully blends sharp wit with heartfelt emotion, exploring the nuances of family relationships with an intelligence rarely seen in mainstream US cinema. This has been a Payne trademark but the setting here provides a distinct visual flavour as well as an integral feature of the story, whilst the ensemble cast is outstanding. Clooney in the lead role gives arguably his best ever performance, dialling down his natural charm to convey the confusion of a husband and father confronted with some harsh emotional truths about those he loves and – most importantly – himself. Reminiscent of his best acting work in Out of Sight, Solaris, Michael Clayton and Up in the Air, he conveys a certain vulnerability whilst delivering the comic moments with consummate skill. He is ably supported by what is one of the best supporting casts in recent memory. The young actresses who play his immediate family members are terrific. Woodley is a convincingly tempestuous but wise teenager, Miller as her younger sister is believably innocent and Clooney’s familial chemistry with them form the bedrock of the film. There are also memorable turns from Robert Forster as a gruff father-in-law, Beau Bridges as a relaxed relative (seemingly channelling his brother Jeff as a Hawaiian Lebowski), Nick Krause as one of the daughter’s boyfriend, Matthew Lillard as an opportunistic real estate agent and Judy Greer as his loving wife. None of these finely tuned performances would be possible without the screenplay by Payne (with credited co-screenwriters Nat Faxon and Jim Rash) which laces the gravity of the central situation with some brilliantly executed humour. The way the central dramatic scenario is blended with the characters and the wider themes of inheritance and time feel like a masterclass in screenwriting. Payne’s directorial execution is exemplary. He has always demonstrated a keen eye for small, revealing details: the ballot papers in Election, the letters in About Schmidt or the TV clip of The Grapes of Wrath in Sideways. Similarly, The Descendants is also filled with wonderful, human flourishes. 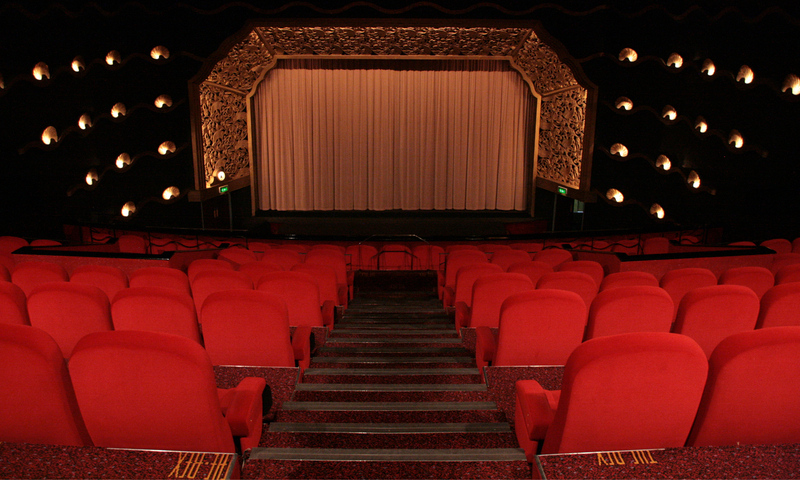 Payne sprinkles them throughout the film with relish and without giving away spoilers, particular highlights feature a swimming pool, a black eye, a sneaky kiss and a farewell speech. Phedon Papamichael’s cinematography is reminiscent of his work on Sideways, creating interesting interior compositions and contrasting them with some gorgeous widescreen exterior work. Hawaii isn’t always presented here as a picture postcard paradise – an opening monologue shrewdly debunks its glamour (“Paradise can go f**k itself”) – but nonetheless it forms a beautifully telling backdrop to the narrative as the climax nears. Payne has admitted that he spent months editing the film with Kevin Tent and it pays off as the comic and dramatic beats are timed to perfection, whilst the Hawaiian flavoured musical score gives the film a distinctive mood and texture. It is also an interesting depiction of the Aloha state, drilling deeper into the heart of the place than TV shows which have used it as a backdrop (e.g. Hawaii Five-O or Magnum P.I.) and even more recent movies such as Punch-Drunk Love (2002), which was partly set there. His early work often focused on his home state of Nebraska, but he has always managed to find universal truths within particular locations. This is the case in his latest film as the family dilemmas are at once specific and yet embedded within the culture of America’s newest state. Mainstream cinema often can’t resist cliché whatever the genre, so it is doubly satisfying to find a filmmaker who excels in combining light and shade whilst using intelligent humour to enhance the gravity of the central narrative. Strangely, it also plays like a reverse Michael Clayton: both lead characters are lawyers with relationship issues, but have to deal with very different financial circumstances. Payne has long been a fan of classic 1970s cinema and where Tony Gilroy’s film channelled the spirit of Alan Pakula, this goes for a more bitter-sweet vibe reminiscent of Hal Ashby. With strong reviews on the festival circuit and the marketing skills of Fox Searchlight behind it, The Descendants is likely to be a major player in the end of year awards season, but it is much more than just token Oscar bait. In what happens to have been a year filled with remakes and sequels from the mainstream studios, this shows that Hollywood can still produce work which appeals to the brain as well as the heart. A new film from director Alexander Payne is a pretty big deal, especially since he hasn’t made one since Sideways (2004). 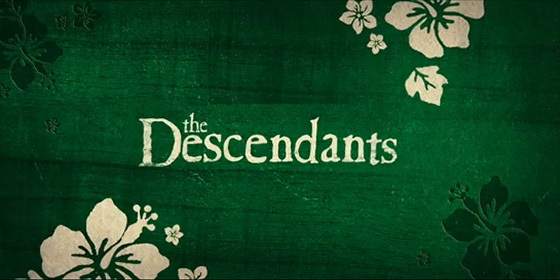 The new trailer has now surfaced for The Descendants, based on the novel by Kaui Hart Hemmings about a land baron (George Clooney) trying to re-connect with his two daughters after his wife slips into a coma. 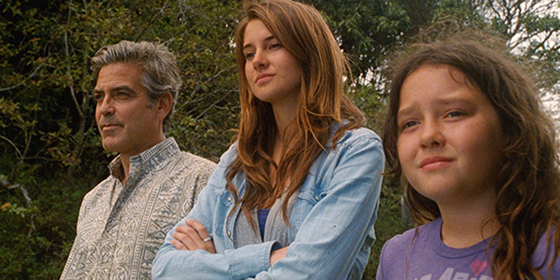 It also stars Judy Greer, Matthew Lillard, Shailene Woodley, Beau Bridges and Robert Forster. Fox Searchlight will be hoping for awards season action when it gets released stateside in December and although a UK release is TBC, I would imagine it would open around January or February.